Good day everyone. It's now a glorious late afternoon and evening and the sun is streaming into my craft room. We had a great day yesterday at Chessington and there were 23 of us altogether. A real family day out which the children (big and little) thoroughly enjoyed. Again we had glorious sunshine and blue skies all day which was wonderful. On to my next creation. 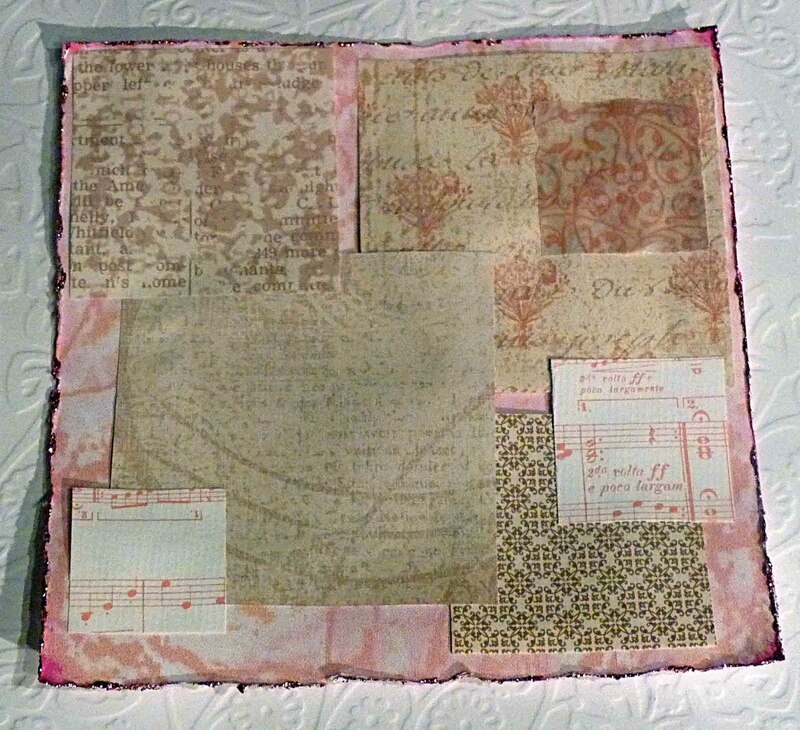 I was inspired mainly by two challenge blogs for this one, both Pollycraft, to use pink, brown and either green or yellow (as you can see I chose green) and the Shabby Tea Room which has a lovely photo of patchwork and the theme is squares. I was also inspired to try new things by watching some of the demonstrations at Alexandra Palace at the weekend. This is the result. I started by making the frame and used a mix of PVA and water to make layers sandwiched by lime acrylic paint and heat blasted the top layer of paint to get this cracked, weatherboard effect. Then I dabbed the TH acrylic paint over the top in raspberry, heat blasted it again and then rubbed most of it off so that the cracks are filled with the pink colour. 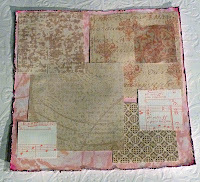 I made the layer underneath this by using all squares to make it look like a montage of patterns and colours. 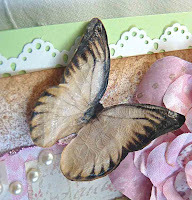 The layer beneath this I used the Spellbinders butterfly impressabilities on white card, edged it with DI vintage photo and sprayed it with coffee shop Glimmer Mist. Lastly I mounted it on white card edged with a MS punch and onto green card. The flower I made myself by cutting out about 7 different sized squares and folding them to cut petal shapes, then spraying them with tea rose Glimmer Mist, scrunching them up to get the shabby look and layering them up and securing them with a pearl brad. During this process I found that the colours in my box I use for spraying came through on the edges of the petals and gave it a real vintage look. This was a happy experiment that worked better than expected. My butterfly was one I printed off and cut out and then covered it with crackle accents, this has given it a nice effect. The button flower was another experiment using coloured string and sparkly thread and I added lace and a pin with beads on it. 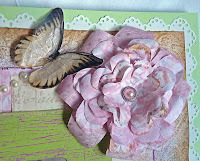 I finished off with a brown ribbon, a brown flourish and a pearl trail from the butterfly. With the vintage image in the centre I am quite pleased with the overall effect. 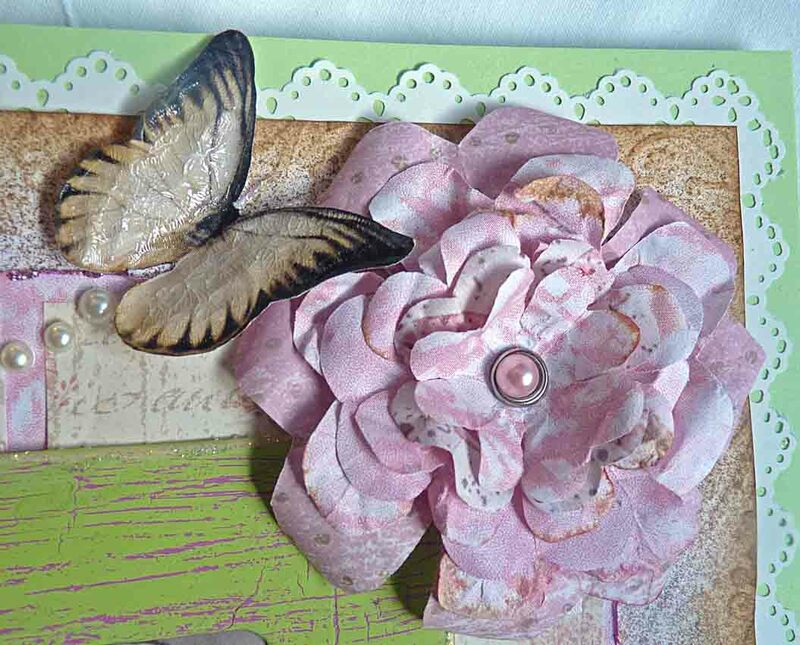 Another shabby chic vintage card to add to the collection. I love reading the comments that come with entering challenges, so I always look to see what other challenges I can enter with my cards. I have quite a list this time. There are some fabulous challenge blogs out there that give real great ideas. Thanks evereyone for providing such inspiration and support. Wonderful card! Thanks for joining us at SSDS this week. What a wonderful piece of artwork. Very much my type of project and all my favoutite products, great work. Another lovely creation Brenda. Thanks for joining us here at OSAAT and I hope we'll see you again on Sunday to check out the winners and the next weeks challenge. Love all the cool techniques you used on this card, and that flower you made is beautiful. And even better that it was created with a bunch of squares. So perfect for the Tea Room's square challenge. The montage background is very fun, too. Thanks for playing along with us. Gorgeous card Brenda, love the image and the beautiful flowers. Thanks for joining in at MTTC. glad you had a good day out. Very special beautiful card just love it. Thank you for sharing with us at TT again. Fabulous card hun! Love that butterfly! What a lovely card. Love the texture and that great flower. Thanks for joining us at TG this week. So many cool elements! Lovely! Thanks for playing along with us at Corrosive Challenges! I love the step by step explanation, and the end result - which is absolutely gorgeous. I love the layering and colours! Thanks for playing at Practical Scrappers! How beautiful! Thanks for playing along with my flutter by challenge! This is a gorgeous vintage page!! Love this! Thanks for joining us at FBW!! 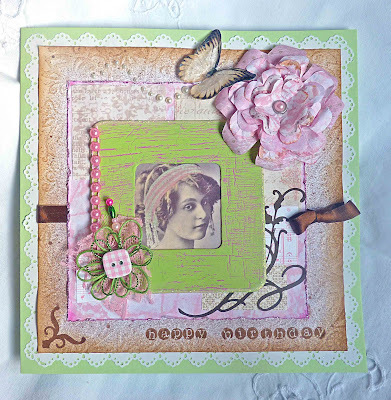 Beautiful card Brenda, love your flowers and your distressing looks fab.